A call to Jonathan Syrett at Camper & Nicholsons confirms that he's taken over the listing for sale of the 28m motor yacht Don Giovanni. A unique little ship, with a personality all of her own, she was built as a twin-engined oceangoing tug by Japan’s Kanagawa yard in 1964. The next three years saw her clock up miles in the titanic task of tugging gigantic blocks of concrete for the construction of the harbor of Lagos, Nigeria, on three-month voyages between Singapore and Africa. 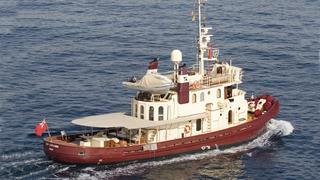 In 2005, she was converted from a working tug to a classic, comfortable and luxurious motor yacht. She now offers accommodation for up to eight guests in a spacious owner’s double cabin, two doubles and a single with a Pullman berth, all with en suite bathroom facilities Twin 1,050hp diesel engines give Don Giovanni a range of 5,000 nautical miles at 10 knots.